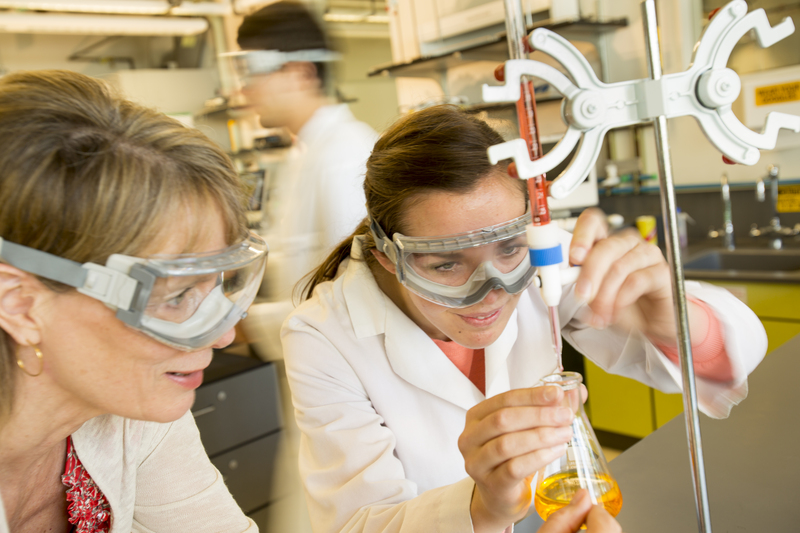 The UO Department of Chemistry and Biochemistry offers major and minor degrees in chemistry and biochemistry. Our undergraduate courses are taught by research and instructional faculty. Chemistry and biochemistry majors complete an integrated, rigorous program that includes foundational course work in chemistry and biochemistry and additional course work in related fields. Undergraduate majors also benefit from taking graduate courses in synthetic, physical, materials, computational chemistry, biochemistry molecular biology and modern instrumental techniques. The ACS-certified degree further emphasizes laboratory experience and the development of professional skills. A unique strength of our program is the opportunity for undergraduates to participate in the activities of a dynamic research group that considers problems extending well beyond textbook instruction. Graduates of our program will have a robust set of fundamental competencies that are knowledge-based, performance/skills-based, and affective.